Ronnie Lott to Speak at Venture Forum | CVF Capital Partners, Inc. The Central Valley Venture Forum literally brought in a heavy hitter for its 2013 keynote speaker. 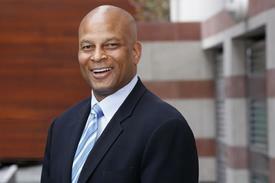 One of the most feared hitters in NFL history and former San Francisco 49er Ronnie Lott, also an accomplished entrepreneur, will serve as keynote speaker at the eighth-annual Central Valley Venture Forum. The event is hosted by the Lyles Center for Innovation and Entrepreneurship at Fresno State and the Central Valley Fund. It will be held on Oct. 29 from 8:30 a.m. to 5 p.m. at the Save Mart Center. Some of the other speakers will touch on topics regarding economic forecasting, Hispanic business growth and other issues affecting business owners. Individual tickets cost $70 if purchased before Oct. 15 and $75 after. For more info, visit www.valleyventureforum.com or call (559) 917-771.